Don’t forget that this weekend daylight savings time ends, which means you will want to set your clock back an hour before you go to bed Saturday night. Enjoy that extra hour of sleep! This Sabbath is Homecoming Sabbath at Madison Campus. I hope you have been inviting your friends and acquaintances as this will be a great Sabbath for (re)connections. 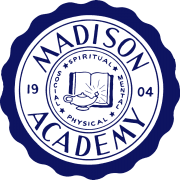 My sermon title is “Built to Serve” and it will celebrate Madison’s history of service to our community and the world and show how we are continuing with the vision that originally founded this amazing campus. Our church services and Sabbath school will happen at their normal times. After second service, we are encouraging everyone to drive to Paradise Ranch where the social committee is providing lunch. That means the only thing you need to bring is yourself, your family, and friends. The meal starts at 1:30 pm. From 2:30 to 4:30 pm there will be a concert that you can listen to while enjoying popcorn and hot chocolate. The event will conclude with an animal show from 4:30 to 5:30 pm. This will be a tremendous opportunity for community building and fellowship so I hope to see you there! 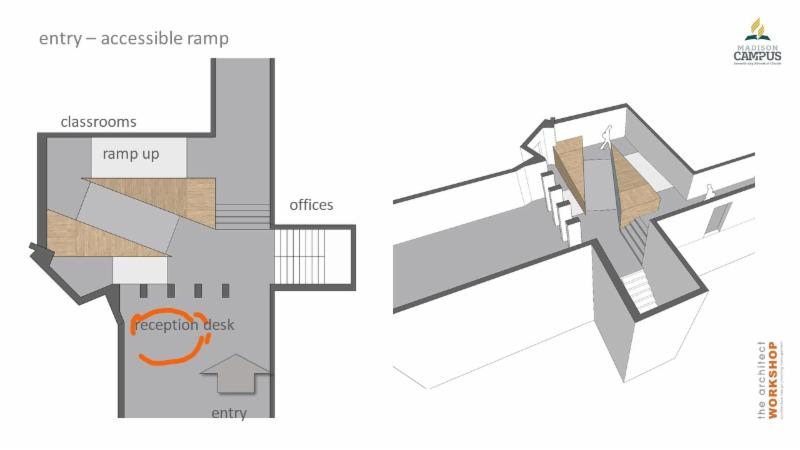 A very important component of our church renovation proposal is making the church accessible for everyone. There are a number of improvements that will make the church easier to use for those with various challenges such as being in a wheel chair or using a walker. One of the major improvements is the ramp pictured above that will make the Larkin Springs entrance accessible to those with mobility challenges. Currently, anyone coming in through the Larkin Springs entrance in a wheel chair has to turn around and come in through a different entrance. This is especially problematic as this entrance appears to be our main entrance and because the church offices are located just above the steps. If you have any questions regarding the renovation proposal do not hesitate to reach out to me with your questions. Please plan to attend our November 10 church business meeting that begins at 5 pm. Your voice is important as we make this significant decision. Set your clocks back an hour Saturday night. The church office will be closed Wednesday, November 7th. There will be a church business meeting, Sabbath evening, November 10th at 5 pm. Main agenda topic will be the church remodeling project. Mel & Phyllis Brass and Brent and Sharolyn Snyder are hosting a Thanksgiving meal for anyone that does not have family/friends to celebrate with this year. We will be celebrating together November 22, at 1:30pm at the Paradise Ranch & Retreat, 2701 Bedwell Rd., Springfield, TN. A vegetarian meal will be served. Please RSVP to 615-714-3274 or ssnyderzoo@aol.com no later than November 20th. Celebrate Recovery is partnering with other ministries of the church to do the Angel Tree again this year. We have 80 Angels, so text 615-945-8055 to reserve your Angel. Look for future announcements in the church newsletter. The Sharp Family thanks MCC for your support for the Buddy Walk this past Sabbath. The event raised a record amount for our local Down Syndrome Association, which uses the funds for a host of educational and support programs. The church’s booth was a huge hit with the thousands in attendance. This is what loving God, loving people, and serving the world looks like! Christopher, Alicia, and Matthew Dellen will have a sacred solo and duet piano concert on November 17, at 4 pm here at Madison Campus Church. Christmas is coming and that means our annual Christmas play is right around the corner. We are looking for actors to help fill out our cast. If you are interested in participating, please contact the church office and provide your phone and email information so we can contact you with details. Have you heard God’s call to ministry, but you feel that your busy schedule doesn’t allow you any time to serve God in a special way? How about a mission project where you could set your own hours? In an effort to increase financial support for current ministries and to help support future ministry plans at the 403 Center, we would like to maximize our Thrift Store sales through Social Media Advertising. If this would appeal to you, contact Karen Baker at 615-516-8631 or David Bell at 615-389-9692. If you have thought about becoming a volunteer at Adventist Community Services (403 Center), now is a good time. What is holding you back? Due to the severe shortage of volunteers, Thursday operations will be shut down, effective November 5, 2018. Currently, the 403 Center is in need of 4 cashiers, 1 Help Center interviewer, and 3 donation processors. Without these positions filled, the Center will be forced to drop from 3 active days to 2, effective November 30. If you have a heart for this type of ministry, please contact Karen Baker at 615-516-8631. Join us in reading through the Bible together as a family. Even if you haven’t done the readings so far, it would be great to have you start now. I think there is a real blessing in reading the Bible together. Hard copies of the Bible reading plans can be found at the kiosks in our lobbies. Here is a link to the online Bible reading plan for November and December Let’s Read the Bible Together. There are new printed (white) copies on the kiosks also. Nov. 7: Church Office Closed today. Last Sabbath the Down Syndrome Association of Middle Tennessee (DSAMT) held their annual Nashville Buddy Walk® to celebrate and support individuals with Down syndrome and their families and to promote understanding and acceptance of those with Down syndrome. According to their website over 5000 people were expected to participate. 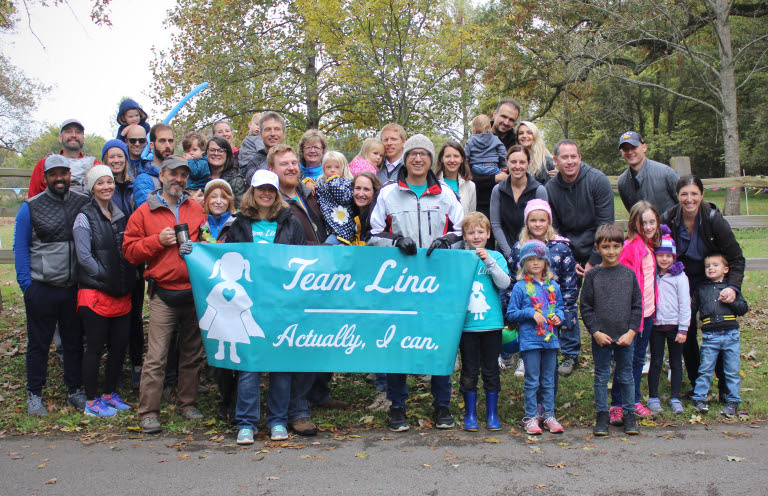 Many members of our Madison Campus family were there to support “Team Lina,” one of our Madison Campus kids. In the picture above Lina is pictured in the center wearing the cute rain jacket with the bright flower. 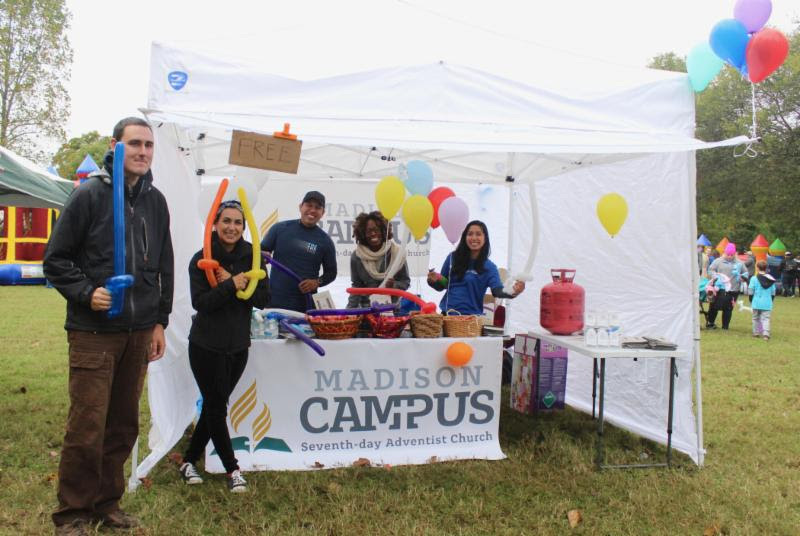 In the picture below is our Madison Campus booth where Pastor Nacho and volunteers gave away information about MCC, candy, balloons, and made balloon art. Thanks to all those who gave of their time and energy to live our church mission to love God, love people, and serve the world. Last Sabbath, God’s Sabbath rest was shattered, when a man filled with hatred and evil murdered 11 worshipers at a Jewish synagogue in Pittsburgh, Pennsylvania. Unfortunately, this is just the latest in a long history of anti-Semitic violence. Violence against Jews is so prevalent that Jewish communities in America have a protocol that armed guards must be present whenever there are meetings with 75 or more gathered. While it is 2018, unfortunately, racism is still alive and well right here in Nashville. A friend of mine who is Asian-American told me how she and her friends had experienced racists comments just this last weekend here in Nashville. Those comments were painful to her and her friends and took a lot of the fun out of what was supposed to be a great weekend. She is not alone. African-American and Hispanic friends have told me of similar experiences. God’s word couldn’t be any clearer. Racism is sinful. Hate is sinful. Those who hate do not know God and can have no place in God’s kingdom. So what are we to do about racism as Christians? First, we need to carefully examine our own lives to be sure that we are allowing God to take away any racist prejudice we may have. Second, we should not believe that just because we don’t perceive racism around us that it isn’t a problem we need to do something about. Many of us are very unaware of how prevalent racism is because we are not the target of it. Finally, we need to speak up when we see racism taking place. We should not leave those being mistreated to defend themselves. We should quickly speak up for them and protect them.